Caroline Limbert (Cardiff Metropolitan University) on the first overseas Health Psychology MSc to be accredited by the Society, and what the experience has done for her own career and that of the graduates. Internationalisation is an increasingly important feature of university education today, reflected in a wide variety of initiatives designed to increase graduates’ abilities to operate in and add value to the global economy and a world with diminishing boundaries. The Higher Education Academy, which sets and maintains the standards for higher education, argues that internationalisation is important for universities as it can help to build their reputation across the world, enrich the programmes provided and also make them more sustainable, perhaps by accessing new markets for students and funding overseas (Higher Education Academy, 2014). In terms of career opportunities for students, graduates and members of university staff, engaging in the internationalisation agenda has a lot to offer. Internationalisation in higher education has been defined as ‘the integration of an international or intercultural dimension into the tripartite mission of teaching, research and service functions’ (Foskett & Maringe, 2010, p.1). Some critics have argued that this process of integration can lead to an increasing uniformity in language and culture that could destroy the very basis on which some approaches to internationalisation rest, leaving just an economic, so arguably less admirable, aim in place (Lumby & Foskett, 2016). However, alternative approaches to internationalisation include the opportunity to value and emphasise cultural differences as a result of an exchange process (Teichler, 2009), and it is this attitude that was embraced by Cardiff Metropolitan University and the British Psychological Society (BPS) when considering the accreditation of the first MSc Health Psychology programme outside of the UK. The newly accredited MSc Health Psychology programme is based at City Unity College in Athens. The focus of health psychology on the application of psychological theory and evidence to health enhancement, coping with chronic conditions, improving health policy and healthcare provision and improving health-related attitudes and behaviour (see www.bps.org.uk/dhp) means that there are a number of areas included within the field that are very interesting to compare between the UK and Greece. A BPS-accredited qualification at postgraduate level is a fantastic vehicle for enhancing opportunities for students and staff alike to explore those differences and learn from the diverse approaches used in other cultures. The accreditation also means that graduates from the programme at City Unity College have the same skills and knowledge base as UK graduates, and so the foundation on which to build with Stage 2 health psychology training where required. 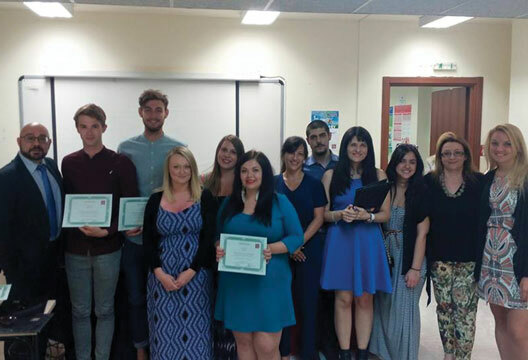 The MSc Health Psychology programme at City Unity College in Athens is currently in its third year since the first cohort walked through the doors. The programme includes identical modules to those at Cardiff Met, and all teaching materials and assessments are made available to staff in Athens. However, the different emphasis in each country means that changes are made to those materials by our Greek colleagues in order to make the materials more pertinent to their target audience. Also the specialist areas of staff members are given scope to be included in the teaching sessions so that the benefits of an expert, research-led approach to teaching this constantly evolving subject are maintained. The quality assurance procedures at Cardiff Met are mirrored at City Unity College. When we go through a periodic review, they go through the same process; the staff–student liaison processes and general regulations are on a par on both sites; and recruitment of staff and students and moderation of marking are all overseen by the moderator, who is currently the Programme Director of the Cardiff Met-based programme. The moderator visits the programme in Athens twice a year to monitor the way the programme is run, exchange information and provide training as required and generally develop the working relationship with the team based in Athens. There is also a separate external examiner who oversees the City Unity College programme and provides an additional check that the programme meets the standards we would expect to see in a course based in the UK. These roles can help to enhance the day-to-day existence of university staff, broadening experience and adding an additional, interesting challenge that can have benefits for career development. The advantages to Cardiff Metropolitan University of having the MSc Health Psychology programme at City Unity College includes the inevitable financial considerations, but the benefits to Cardiff-based students include funded exchange visits; visiting lecturers from Athens; dissertation projects that straddle both sites by collecting data in both the UK and Greece and being supported by staff in both countries; and development of a better understanding of how health-related behaviours, policies and outcomes can be very different, despite the relative proximity of Athens and the fact that we are all, currently at least, part of the EU. From the point of view of the Athens-based students, they also benefit from visiting students and staff from the UK contributing to their programme; the option to conduct cross-cultural studies for their dissertations and of course the development of a broader understanding of the context of health-related issues. But for the students in Athens, the BPS accreditation is key. It enables them to obtain recognition for their qualification by a professional body that is highly regarded in Greece and enables them to continue to develop their careers as health psychologists, should they choose to do so, in a way that does not exist in Greece. The drawbacks of the programme in Athens to those of us at Cardiff Met were initially focused around the difficulties of working with people from a distance, people we didn’t know and people who had a very different way of doing things to us. This ‘problem’ has greatly diminished over time as we have got to know our friends in Athens, become familiar with their ways of working, as they have with us, to the point that we have now reached a position of mutual respect. We don’t expect everything to be the same, but value difference as long as the standards are maintained. Three years in we have learned a lot from each other. The drawbacks that still remain include the time it takes to oversee the programme in Athens, to visit twice a year, to complete the paperwork and engage in training and other combined activities. But as long as workloads can be designed to reflect the time that needs to be devoted to collaborative provision programmes, this should not be a significant problem either. So what of the cultural differences in health behaviour, some of which startled the students? They include the fact that Greek students seldom binge drink or drink to get drunk. However, they are much more likely to smoke than their British counterparts and the social aspects of enjoying an iced coffee and a cigarette together were cherished by the Athens-based students and staff. The fact that the Greek students address their lecturers using their title and family name rather than first names, as used by the British students, introduced some interesting discussions regarding whether the use of more formal titles reflects higher levels of respect for members of the health psychology team. Another interesting line of discussion was around the cost of medication in Greece, especially in the light of the recent austerity policies. A case study involving a Greek woman who spends much of her pension supporting her unemployed grandson (something else that is possibly less likely to happen in the UK), and also a considerable amount on her prescription drugs, opened the students’ eyes to the benefits of the NHS and the relative economic stability in the UK (despite the imperfections that we are all too keen to grumble about). The plans are to develop more staff and student exchanges between Athens and Cardiff; to conduct more research exploring the health-related differences between the two cultures and the impacts they have. We already have one graduate from the Athens-based MSc Health Psychology programme who is undertaking a PhD at Cardiff Met and also working on BPS Stage 2 health psychology training, something that would not be possible if her MSc had not been BPS accredited. The future prospects are potentially endless as we operate in a global economy where a better understanding of the way health behaviour, health policy and health outcomes compare between different cultures is valuable in order to optimise health education and health provision and to ensure smooth transition for people making the most of the diminishing boundaries throughout the world. The experience of spending some time overseas and/or obtaining an in-depth understanding of the differences between the cultures in terms of educational practice and health-related behaviour has been invaluable for both staff and students based at or visiting the MSc programme at City Unity College in Athens. Broadening the understanding of how the economy, culture and policy can impact on health-related behaviour at the individual level is so much more possible as a result of experiencing these issues firsthand and talking to people on the receiving end. Many graduates from the programmes, both in Cardiff and in Athens may well find themselves working in other countries: in fact we have already had graduates working in Australia, Haiti, Mauritius and Spain to name just a few. The experience of conducting a cross-cultural dissertation or PhD, as has also happened as a result of this relationship, prepares students for careers that are not bound by the familiar and limited experiences of their own country and culture. Linking the two programmes makes it possible to build a supply of health psychology graduates prepared to tackle global health issues in a way that is becoming increasingly necessary in the world without boundaries. For example, antimicrobial resistance, obesogenic environments, addictive behaviours and chronic conditions are all relevant issues for health psychologists that extend beyond the borders of the UK – exploring these issues from different cultural perspectives can help to provide solutions that would not otherwise be available or considered. The development of more overseas MSc Health Psychology programmes with BPS accreditation, and the development of international doctorates in health psychology, would be a beneficial development and help to facilitate this recognition that health cannot be contained within geographical or political borders. Foskett, N. & Maringe, F. (Eds.) (2010). Globalization and internationalization in higher education: Theoretical, strategic and management perspectives. London: Continuum. Lumby, J., & Foskett, N. (2016). Internationalization and culture in higher education. Educational Management Administration & Leadership, 44(1), 95–111. Teichler, U. (2009). Internationalisation of higher education: European experiences. Asia Pacific Education Review. 10, 93–106.